If you really want to get away from it all, head to Washington State. 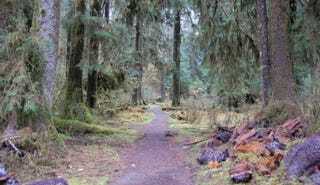 There, on a trail along the Hoh River, in the rain forest of Olympic National Park, only 40 miles from Seattle, it’s what one scientist has deemed the quietest place in the contiguous United States. Hempton’s hearing began to return 18 months later—again out of nowhere—and shortly thereafter, he made it his personal mission to visit natural spaces in all 48 continental states in search of the quietest place he could find. Though he didn’t measure decibles in every square inch of the country, he experienced enough of them to know true quiet when he heard it. He marked his choice with that red pebble, three miles into Olympic National Park, and named the spot One Square Inch of Silence (OSI). It’s the rare place in America that is absent of human-made noise for up to 20 minutes at a time. Since 2005 Hempton has been on a mission to protect America’s quiet places, arguing that sound is as vital as physical landscape to preserving the habitats and well-being of local wildlife. But quiet places are also becoming endangered. In 2010 a documentary was made about Hempton’s project, which explains how places he formerly deemed quiet are getting louder. It’s amazing that it’s still possible to find such a pronounced quietness in a popular national park, but I found myself wondering how Hempsted decided this was definitely the spot. Surely it’s far more quiet somewhere far away from hiking trails and more than 40 miles from a major city? (This study claims the Great Sand Dunes in Colorado are quietest.) But then again, perhaps the rain forest does wonders for absorbing sound—like nature’s white noise machine. Seeking some peace and quiet? Navigate to 47°51’57.5”N, 123°52’13.3”W. Or you can simply head to Hempton’s website and enjoy the silence through his recordings.